Every once in a while, something comes along that has the potential to really make your day. Since I tend to spend a bit of time entering contests on various blogs, sometimes I win fun things like movie passes, gadgets or board games. 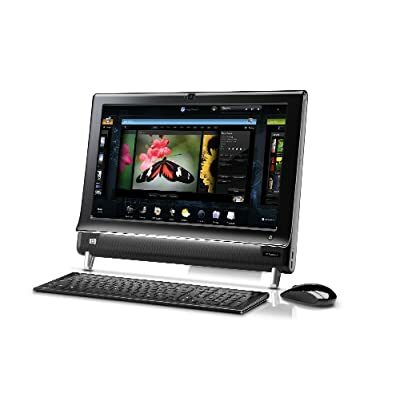 Well, tonight I found out that I'm a finalist to win a new HP TouchSmart computer from HighTechDad and HP. Just in time for Christmas, too. It's very exciting to be name one of 10 finalists. Yes, I have a 1 in 10 chance of winning. Sort of. ...and hopefully, you'll spread the word to friends and have them vote too. What would you think if I said that 25 years from now, you'll be married to a fantastic man, have two beautiful daughters, have seen some wonderful places and be retired? As you look around, that doesn't seem very realistic, does it? You feel unpopular, ugly and sad. But I'm here to tell you that it's all true. It will happen if you stay on the right path. You're going through a rough time, I know. I remember. But seriously, it's really not as bad as it seems. The braces will come off and you'll shed the glasses for contacts. You'll do great in school, too. Believe it or not, you WILL eventually have a boyfriend. You'll smile with confidence and make people feel at ease around you. But I'm not going to say everything is rosy. The hard truth is that you'll find more difficulties in the future, too. Depression, an eating disorder, financial strains, infertility and depression (again) to name a few. But you'll get through it and you'll come out stronger on the other side. Alongside your husband, you'll become financially savvy. Your children will make you feel old and young at the same time. You'll see some family members leave way before their time and others live to see great-grandchildren. - You're not perfect. Nobody is. - You won't have the perfect life. Nobody does. - Realize there's a difference between being hard on yourself and beating yourself up. - You're a good person, even when you are at your lowest. - You'll have some friends who stand with you and help you... you'll have others who use you and abandon you. - Experience will show you that life is not fair. Some people lie and cheat to get ahead while others work hard just to make ends meet. You will get passed over for job promotions but something better will come along if you maintain a positive attitude. It all works out eventually. When I started this letter, I had every intention of telling you YES, apply for West Point or Harvard like you (will) consider. But then I realized that the decisions you're about to make... that I DID make... got US to where we are now. And if I had to do it all over again, I would. The same way. With all the mistakes, hardships and all. I'll close this letter by simply saying "Hang in there. Just keep your chin up and have hope because good things happen to good people." A much older, much wiser and much more confident you. DH and I decided to have lunch at Bishop's at Southpark Mall yesterday. The last time we ate there was before we moved to California. But I had a B1G1F coupon and Bishop's French Silk pie sounded awesome. After we ate, we walked around the mall and were amazed at how many stores were no longer in business. I guess traffic at the mall just isn't what it used to be. I pointed at one such store by the name of "G Spot" that was obviously empty. Quick-witted DH responded "It probably closed because nobody could find it." I couldn't put my finger on my 1st grader's funky sense of fashion lately. I've been trying to give her some independence when it comes to selecting her outfits but I've also tried to give her a little direction. For instance, she'll pick out a piece for the day and I'll give her suggestions about what might match it. Don't get me wrong, I'm not a fashionista - quite the opposite. But I try to make sure that the different pieces work together... more or less. Well this morning, Miss M just wanted to argue with me. She wanted THIS shirt and THAT pair of shorts. The shirt was mostly dark pastels with purples, greens and blues with a small pattern. The shorts a few shades of pink, yellow, and red with large daisies and butterflies. No matter how many times I tried to tell her that they didn't work together, she just didn't want to listen. "But Mom, I want to wear lots of colors so when the teacher calls a color I can get in the front of the line." Sigh. That explains so much. How Did My Photo Get There? During the course of the BlogHer Conference in Chicago, I took pictures with various people that I was excited to have the opportunity to meet. Celebrities, fellow bloggers, people I admire. Mel, my roomie at the event, brought a fancy film camera to BlogHer. I took several candid shots for her so she wasn't always using her film. Following the conference, I shared all my digital photos with her and was surprised to see all of them end up on her Flickr account. No big deal though since there wasn't anything personal, private or embarrassing. Mostly just photographs of the event, the people and the chaos. I didn't think twice about it. Well, imagine my surprise today when I noticed that Mel posted a message on Twitter a few days ago. The picture on the far left is me with Donna Byrd, Publisher of The Root, following a keynote presentation at BlogHer09. 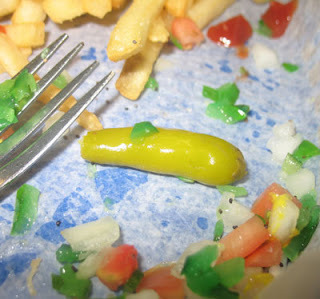 In an attempt to gain some control over the effects of the recession, restaurants like IHOP have been offering special promotions. IHOP, specifically, is offering "Kids Eat Free" where you get one free kids meal from the "Just for kids" menu with the purchase of each adult entree. Yum, IHOP. I decided it sounded like a good plan for dinner because, well, I didn't have anything thawed and didn't want to cook anyhow. And IHOP was offering free dinner for the kids. I love free. So we headed off to IHOP, with Miss M exclaiming she wanted pancakes AND some of what Dad usually orders. 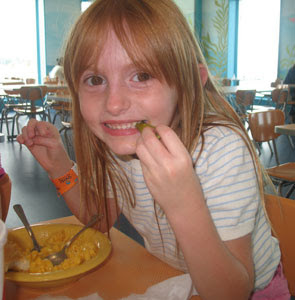 Miss K proclaiming that she only wanted what Dad usually orders. What does DH usually order? Country fried steak with pancakes, hashbrowns and eggs. Think they have it on the kids menu? We hoped so. Did they? Unfortunately not. So we asked the kids what they wanted instead. Miss M agreed to just have the chocolate smiley face pancake but Miss K stood her ground. She can be a difficult eater and if she doesn't eat well then DH and I don't enjoy our meal. It's frustrating, a waste of money and a pain because then she wants to eat something else when she gets home. So we had a plan. I would order what I wanted and get Miss M her pancakes as part of the "Kids Eat Free" program. DH would order what he wanted and get a second entree free using a coupon from either the paper or our restaurant book. Everyone would get what they wanted. Sure we would end up with leftovers but that's okay because both kids would eat well and we would all enjoy the meal. You know what they say about the best laid plans... When the server came to take our order, he said that we couldn't combine the offers. It says so on the coupon and on the sign. He explained that it's their policy that even if we split the check, the fact that we were at the same table prevented combining of coupons. He was polite, but we were frustrated. We asked for a few minutes so Miss K could decide what she wanted and she decided she wanted Chick-Fil-A which was just two building over. Miss M agreed. DH knew I was in the mood for IHOP but I said to him "Yeah, but I won't enjoy my meal if she's going to be difficult." So we agreed to leave. We hadn't ordered anything except water at that point so IHOP wasn't out anything except our business. But as we walked out, a gentleman (who had been seated at the booth right next to us shortly after we sat down) stopped DH to say he overheard the entire conversation. "Good for you. It's hard enough to afford to take kids out to eat; I thought it was ridiculous that they wouldn't honor the coupon. I left too. I just wanted to let you know that you have my support." So I guess IHOP was our business and his. Yeah, I realize that IHOP has their policy, but we weren't asking for two free kids meals at the price of one entree. We were simply trying to get the foods that the kids would eat utilizing the resources we had on hand. If their goal is to bring in business then they need to think outside the box because if it isn't something you want, then free just isn't good enough. ...and as a bonus, Chick-Fil-A let us use two B1G1F coupons from our restaurant book. Nice. Some of you may recall my green thumb series last summer... the story of how I started my first vegetable garden followed by a few progress reports. Throughout the winter, I continued to enjoy the fruits of our labor in the form of soups, chili and spaghetti sauce. Each time that I pulled another container of tomatoes or bag of carrots out of the freezer, I smiled at my little piece of success. There was no doubt in my mind that I wanted to plant another garden this year. Unlike last year, I'm not waiting until plants and seedlings are almost gone from the local stores. This year we're planning things out better. I sat down and thought about what I wanted to put in the garden this year. While I enjoyed having carrots, I didn't feel that they were a good use of space. Instead, I want lettuce, more onions and shallots. I surfed the net for different types of tomatoes and decided that I wanted grape tomatoes for snacking, a beefsteak tomato for everyday use and some orange or yellow tomatoes for variety. I picked out the types of onions and shallots that I preferred and handed the list to DH. If you have never checked out the produce section of eBay, you will be completely amazed. There are some awesome varieties available. Looking for a white tomato, a red cucumber or a purple pepper? Only have a certain amount of room? Shooting for container gardening? Need something that is fool-proof for the beginner gardener? Read the descriptions and you'll be surprised what you can find. Some are outright funky. As a bonus, you can probably get everything you want all from the same seller and save on shipping charges. A few weeks ago, we planted seeds into four prefilled biodegradable containers. I kept them in a warm, sunny place and spritzed them with water every day. When they didn't start to sprout when they were supposed to, we moved to plan B. 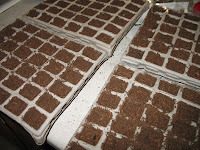 We placed the trays inside greenhouse boxes and filled the bottoms with about half an inch of water. We covered them and let nature take over. 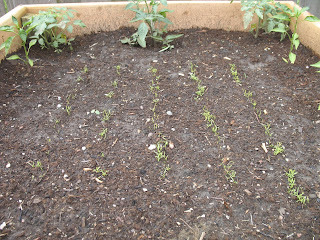 The onions and peppers are showing little progress, but the tomatoes are doing very well. This is a project that DH and I are doing together and once the garden is ready to plant will become a family project. I'm very excited about the fact that something I put into the ground (or pseudo ground in this case) is actually coming to life. I don't have a green thumb and am often afraid to bring plants into my home because they usually die. Thankfully DH is helping out! Stay tuned... There's more to come, including the assembly of another raised bed! Yesterday at the gym, they had a table set up doing dental screenings for children. My girls were quite excited to get brand-spanking new toothbrushes. They act like they never get a new toothbrush! I digress... As I was talking to the woman who set up the table, I noticed a stuffed Nemo as part of her display. I laughed and as I recounted the goldfish story to her, I realized that I hadn't shared it on my blog yet. How about before Christmas. Yup. That's a good place to start. 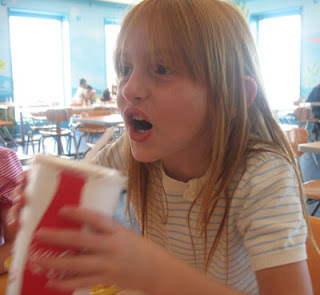 Miss M wasn't even 6 yet and Miss K had just turned 4. Our family dentist said that children can't brush their teeth effectively until they are much, much older. So what I do is let the girls brush first then I follow up with my more thorough approach. Brushing our teeth has always been a natural part of our bedtime routine. But for some odd reason, probably chaotic schedules, morning brushing hasn't exactly been a priority. Yeah, that's my fault but when I'm busy and running around trying to get Miss M ready for school while juggling getting myself and Miss K ready for the gym, I tend to get a bit flustered. As many times as I would ask them to go brush their teeth by themselves in the morning, they seldom would. "Tsk, tsk, Nicole. They're only 5 and 4 - what on earth would compel you to believe they would do it on their own?" In the meantime, someone besides me decided that the girls needed goldfish. Probably because every time we went to WalMart they wanted to go look at all the fish. Didn't matter what they saw in the tank, they always got excited. Add another thing to my to-do list, but okay... if it will make them happy then I'm game. Then came Christmas. DH and I purchased matching beginner bowl sets for the girls. They were cute and even came with rocks and a plant. When we returned from Christmas out of town, the girls were allowed to go to WalMart and pick one goldfish each. The were delighted. When we got home, DH set a few rules. Two - the fish cannot be fed until the beds are made and the teeth are brushed. The girls agreed without any complaint. No longer do I need to beg them or remind them to brush their teeth in the morning... they usually remind ME! Sometimes on weekends, I have to ask them if they've made their beds yet and brushed their teeth because "Your fish is waiting for breakfast." That's not bad considering I don't usually have to remind them during the week. Here we are in March and the fish are still alive. 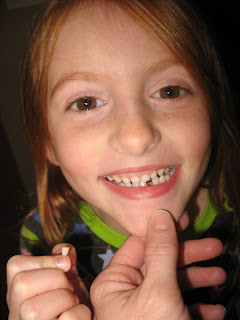 Basically, it cost us 40 cents to get the kids in the habit of brushing their teeth twice a day. And the fact that they make their beds in the morning as part of the deal is just a bonus. Have you bribed your kids lately? Congratulations to The Fiedlers for their winning entry! Vouchers are on their way so tell your daughter to start practicing her singing! I'm wondering if text messaging, instant messaging and email are dumbing down the next generation. I find myself typing in acronyms all the time without even realizing it. While I reference my husband as DH (Darling Husband) on the blog, that's merely so I don't type his name. But there are tons of other times that I catch myself doing it when typing emails to people who don't even know me very well. For example, one of my readers recently commented that she didn't know what SAHM means. Well, it's Stay-at-home-mom for those who didn't know. That's a prime example of me taking for granted that someone knows what abbreviations or acronyms stand for. And I'm in my late 30's and don't even use text messaging these days. Think about it. We type things like JK (just kidding), LOL (laugh out loud), IM (instant message) all the time. No, I'm not planning on typing out an entire list - I was just trying to make a point. I sometimes wonder if kids are going to lose the ability to spell because they simplify everything to expedite messaging. Only time will tell, I guess. But one thing that caught me off guard is that I know what HSM stands for when I haven't even seen the movie yet. If you're a mom and don't know what HSM stands for, then please go to your purse, remove your "I am a certified Mom" identification card and destroy it immediately. You'll need to reapply for that license when you are able to pass the exam. HSM stands for High School Musical. Until recently, we had only been taking the girls to see animated movies at the theater but we realized that they are ready for more. We've watched a few non-animated movies at home and the girls did not lose interest. DH and I plan family movie night with the girls pretty regularly and have High School Musical on tap for the next sit down. I am certain they will love it and expect HSM 2 and 3 to follow. As luck would have it, I was presented with the opportunity to talk about High School Musical: The Ice Tour. Before Christmas, we had been talking about taking the girls to see Disney on Ice, but we ended up missing it. Even if we had purchased tickets, we would have still missed it because we've all been sick so much! But we saw an advertisement for High School Musical: The Ice Tour and thought it would be fun to take the girls to see. So when I was contacted by the promoters about blogging about the show, I realized it was fate. I'm very excited to say that I have a Family Four Pack of vouchers to the March 16-17 event at the iWireless Center in Moline, Illinois. Yes, I'm bragging that the girls will definitely be seeing this event, but I'm also bragging that I have EXTRAS! Feel like making the trek to Moline with three of your favorite High School Musical fans? You guessed it, these extra vouchers are for one of my lucky readers! What's the catch? Well, the vouchers can't be sold so if you don't know someone in the Quad Cities or surrounding area that can make use of these then you probably don't want to enter. The vouchers need to be redeemed at the iWireless Box Office for any available seat (excluding Front Row and VIP) for your choice of the March 16th or 17th event. If you're game to enter my giveaway, the details follow. If you're unfamiliar with blogs and skeptical, you can purchase tickets at Ticketmaster.com! The Prize: 4 Vouchers for High School Musical: The Ice Tour at the iWireless Center on March 16th or 17th. ...must provide an email in the first comment, email me directly with an email address or have email accessible from their profile. Winner has 48 hours from posting/notification to respond. If winner cannot be contacted, I will move on to the second random selection. These are time sensitive! 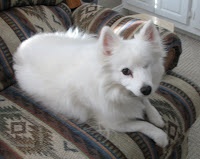 ...must reside within distance to iWireless Center, Moline, Illinois. Sometime on March 10, 2009, a winner will be chosen at random (using random.org) from all comments left. (1) Visit the High School Musical: The Ice Tour website, click on the "Music Player" tab and listen to the songs. (2) Pop back over here to my blog and tell me what your favorite (or your child's favorite) song is from HSM 1, 2 or 3! If your kids are already fans of HSM, then this should be a piece of cake. Just ask them what their favorite is. Yes, it's THAT easy to enter. 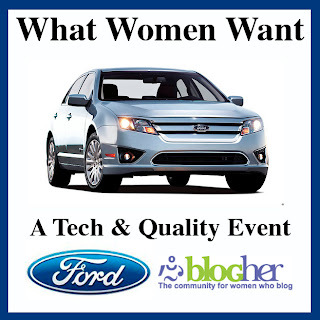 -- Earn an additional entry if you publish a blog post regarding this contest and link back to it. 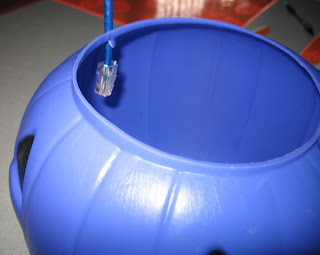 Come back here and leave a comment providing the link to your post. -- Share this post with your friends on Facebook. Leave a comment that you did. -- Follow me on Twitter and Tweet this contest with hashtag #SahmReviews. If you aren't familiar with hashtags, all you do is type #SahmReviews somewhere in your tweet. Comment with your Twitter ID or leave a link. -- Subscribe to my feed via RSS or email... leave a comment. 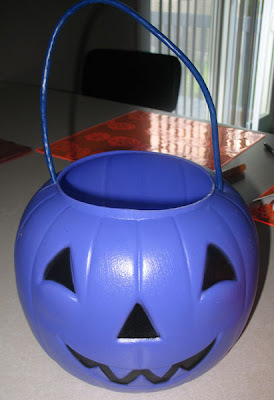 -- Follow SAHM Ramblings on Facebook Of course, don't forget to leave a comment. --Email all your friends to tell them to enter. Please cc me when you do and you'll qualify for one additional entry! Leave one comment that says you emailed your friends. This is a very exciting giveaway for my local readers. If you don't live in the area, you can enter on behalf of someone locally but please leave a note in the comment of who you're playing for... For example, "My sister lives in the Quad Cities and she would love to take her kids." Interested in doubling your chances to win? Flip over to my review blog, SAHM Reviews, for a separate giveaway for another 4 pack! Don't fret if you can't make it to the iWireless Center, High School Musical: The Ice Tour may be coming to your local arena! Check out Ticketmaster for their schedule! "Sorry to hear you have jury duty. We've been back in Iowa for a few years and I haven't been served yet." Viola. Jury Summons showed up in today's mail. Anyone care to add anything else to my list. I don't feel like jinxing myself again. 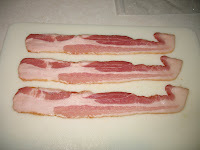 When I was pregnant, my fail-safe food was bacon. We had BLTs at least once a week. I never experienced morning sickness, but I really couldn't stomach meat. 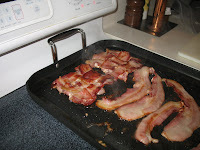 It was terrible for our health but at least I could enjoy the bacon. 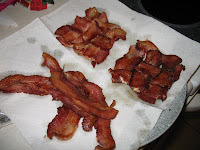 DH stumbled on a blog post about weaving bacon. Sorry that I can't give that blogger credit because I don't know who it was. He surprised me one day by making them and even taking pictures of the steps. (Aren't DH's the best?) 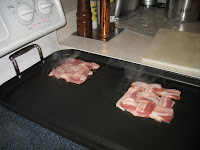 I thought it was pretty cool so we decided to share the bacon weave process. 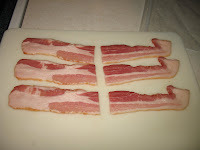 How often can you make a bacon sandwich and know there's bacon in every bite? Add them to a sandwich. 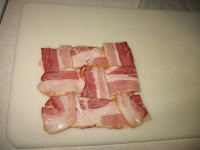 If you use normal bread, the bacon weave will cover the bread perfectly. No more concerns about bites that are all sandwich and no bacon. 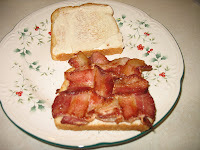 If three pieces of bacon aren't enough for your sandwich, then add two weaves to it! DH - This is an awesome trick. Thanks for sharing it! Me: Hello? Nicole? Are you there? I haven't seen you around. Answering myself: Ummm. Yeah. I think so. What day is it? Me: It's Sunday. That means the kids go back to school tomorrow. I was looking at my blog and didn't realize it has been forever since I posted. The past few weeks have been crazy. We decided to spend Christmas in Alabama this year so things were a little off kilter. The last week of school was filled with volunteer stuff for both kids' schools, work at the church, school programs and parties and OMG a freakin' snow day. Should have been called an ice day because we were covered in ice - not snow. Trying to pack for the trip, take care of last minute stuff then have a snow day. Wasn't what I had planned. There was just enough of a reprieve in the weather for us to hit the road on Saturday the 20th. We drove to Alabama - DH, myself, two kids and two dogs. Was a long trip but well worth it. While MIL was getting her grandgirl fix, I had planned on spending some time relaxing, shopping with DH, maybe hitting a movie, finishing my annual Christmas calendar presents and catching up on reviews for SAHM Reviews. I had not gotten many posts done when DH insisted I step up the pace since after Christmas things would be too hectic to meet any deadlines that I had. But we shopped and went out to eat and spent time with family... and I got in a review post here and there. I have a few posts lined up for here but just haven't gotten to them (yet). We left Friday morning for Henderson Park Inn and returned to Alabama on Monday. In the middle, we enjoyed a few days of nothing but us. We hadn't packed any shorts because DH knew that would lead to nothing but questions from me. Freezing cold in Iowa, not freezing but certainly not warm in Alabama. "Honey, why on earth do we need to pack shorts?" Yeah, good call not to pack them. Since we didn't have the kids, stopping by 15 stores to find shorts we liked wasn't a problem. It was actually enjoyable and we found more than just shorts... and I typically hate shopping for clothes. Once we had the shorts in hand, we headed back to change and walked on the beach for at least an hour and a half. Ahhh, it was so relaxing, so nice, so not-freezing-cold-Iowa. And it was just us. (Can you see me smiling from ear to ear?) Four days and three nights of going out to dinner, a movie, shopping, walking on the beach and relaxing. All sans kids. We even played checkers on a giant checker board during the B and B's happy hour. It was absolutely wonderful. Spending time with DH alone was awesome. Despite the fact that we're together at home all the time, we really don't have that kind of quality time. I can't remember the last time he had me laughing as much as he did this past month. The B and B was a total surprise - I don't know how he managed to pull it off without me knowing. Yeah, he's good at stuff like that. No, I'm not planning on sharing him but I will be happy to set up seminars for him to teach other DH's all his Christmas surprise tricks. 2008 was a rough year with DH and I each losing a grandmother and an uncle. With the stock market making life miserable for us and many others. With us feeling like "if it could go wrong, it did". But thanks to DH, we rolled out 2008 on a great note and I'm enjoying starting 2009 fresh and happy. Thanks to MIL and BIL for their parts in coordinating this special Christmas gift. But most of all, thanks, DH, for being you. For being wonderful. For being my best friend and true love. I couldn't ask for more.